President calls off War on Terror, forswears military force authority. “America is at a crossroads,” US President Barack Obama said on May 23, in a speech that clearly stated his intention to end the US’s state of perpetual war, and to achieve that result at least partly by using drones. As I wrote in Drones: re-inventing war, drones are the key to changing international conflict from being hellishly bloody and expensive mass combat, to being intensely focused violence in a specific area for a short time — that is, policing. Obama used the crossroads moment to strike out on the path towards peace. He started by calling off George Bush’s War on Terror. This was no convocation speech or abstract theorizing from the President. He was addressing military professionals at the prestigious National Defense University — advising them strongly that the next generations of soldiers will have to adjust to this new approach and new equipment. In the same way that Obama’s administration ended a decade of airport signs and repetitive ominous announcements that “The terrorism threat level is orange,” so did he use this speech to tame the tension caused by fear of unknown assaillants — monsters under the bed. The terrorism threat, he said, is about what it has been since the 1980s, and decreasing. Just as he had counted the costs, now he recounted all the US victories against al Qaeda and extremists, and concluded that the US has succeeded in significantly reducing the threat, leaving: “…lethal yet less capable al Qaeda affiliates; threats to diplomatic facilities and businesses abroad; homegrown extremists.” This is the future of terrorism, he said, and also its past, before 9/11. And he described how his administration is addressing each type of threat. 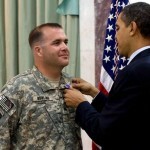 Recognizing the enormous responsibility — “Alongside the decision to put our men and women in uniform in harm’s way, the decision to use force against individuals or groups — even against a sworn enemy of the United States — is the hardest thing I do as President,” he said — he has asked his administration to propose models for judicial oversight of this kind of decision. Obama’s administration has been shifting the entire US defense strategy away from “traditional armed conflicts,” and “readiness” — code words for letting the Pentagon spend bóng đá trực tuyếnup to half of the US federal budget. Traditionally, in the US, "defense" has been the major form of government job creation, leading to a widespread perception that the US is "addicted to war." Think of Shock Doctrine in reverse — at the depth of the Great Recession, the Obama administration moved to wrest back control of the economy from the entrenched military-industrial complex that President Eisenhower warned about in the 1950s. Think of Shock Doctrine in reverse — at the depth of the Great Recession, the Obama administration moved to wrench control of the economy back from the entrenched military-industrial complex that President Eisenhower warned about in the 1950s. An odd thing occurred during this speech, when Obama addressed the issue of the prison at Guantanamo Bay. He reminded the audience that, "As President, I have tried to close GTMO. I transferred 67 detainees to other countries before Congress imposed restrictions to effectively prevent us from either transferring detainees to other countries or imprisoning them here in the United States." And here the transcript shows that he was interrupted by a shout from the audience — from Medea Benjamin of CODEPINK. "There are 102 people on a hunger strike," she yelled. "These are desperate people!" "I'm about to address that," he replied, "if you will let me speak." And for the next few minutes, he let her continue shouting, chiding her only once that, "Part of free speech is you being able to speak, but also, you listening and me being able to speak." But as she continued to raise questions, he went off script and told the audience, "The voice of that woman is worth paying attention to. Obviously, I do not agree with much of what she said, and obviously she wasn’t listening to me in much of what I said. But these are tough issues, and the suggestion that we can gloss over them is wrong." Obama noted that force alone will not guarantee safety, that the US needs to re-build goodwill, and help create stable and prosperous societies all around the globe, to minimize free floating discontent. But the main message he brought to the National Defense University — and no doubt, to the Pentagon — is that they need to be thinking about security in a whole new way. Indeed, Obama describes a new "defense" purpose which sounds much more like policing. If he can change the nature of modern war — from clumsy and destructive to nimble and deadly — that will affect everything from the economy to the environment. The long-delayed Peace Dividend may be at hand.